The Apprenticeship is Over—Now the Real Test has Begun.When word that Yelena is a Soulfinder—able to capture and release souls—spreads like wildfire, people grow uneasy. Already Yelena's unusual abilities and past have set her apart. As the Council debates Yelena's fate, she receives a disturbing message: a plot is rising against her homeland, led by a murderous sorcerer she has defeated before….Honor sets Yelena on a path that will test the limits of her skills, and the hope of reuniting with her beloved spurs her onward. Her journey is fraught with allies, enemies, lovers and would-be assassins, each of questionable loyalty. Yelena will have but one chance to prove herself—and save the land she holds dear. It has been years since I’ve read a book in Maria V. Snyder’s Study series. I read the first two books, Poison Study which was this baller book that I read in one afternoon on a lawn chair in the hot sun, and Magic Study which was okay but certainly not on the level of Poison Study. I kind of lost my momentum for the series. 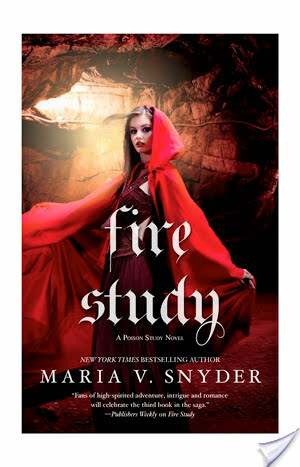 However, with the release of an unexpected addition to Yelena and Valek’s adventures, I figured I might as well read FIRE STUDY finally. Also, it’s sort of a feather in my cap to finish a series (even when there’s a surprise new book). Friends, that’s one of the nicest things I can say about Fire Study, that reading it is a feather in my cap. It’s not that I hated it, it’s that it is so underwhelming and kind of a disappointment compared to the previous two books. Fire Study opens up with Yelena having to apprentice and study magic under a magician named Roze who doesn’t like her. Fortunately or unfortunately though, trouble seems to follow Yelena wherever she goes and so there’s some murders and an escape and so, she accesses her Soulfinder powers to find the Soulstealer. Along the way, she meets back up with Moon Man who is essentially her mentor/guide sort of. There’s also the appearance of Opal, lead character in the Glass series, which I have not read yet. Meanwhile, there’s tensions again between Ixia and Sitia despite Yelena being liaison and ambassador. Oh and because no one knows anything about Soulfinders because they are so rare, no one trusts Yelena, so it seems. OH OH and there’s a fire warper who is super evil and a split off clan of the Sandseeds who basically want to do bad things. So really, this book is about Yelena contending with a lot of things. I hate to say this about Yelena who is one of my favorite characters but she’s SO annoying in this book. I mean, okay I guess I can relate to her. However, she’s super stubborn and that’s to her detriment. She thinks that she is always right and she won’t let other people help. Like, she’s a total douche to Moon Man and y’all, I was not having that. Like, he just wants to help her and part of his helping her and being effective is making her figure things out on her own with some cryptic words but instead like a lazy entitled person, she just wants everything handed to her. Ugh, no. I mean, she does have the redeeming quality of being self sacrificing, but overall I was not Team Yelena when it came to Fire Study. Maria V. Snyder tends to excel in world building. I’ll say that it was nice to return to a world where I had some familiarity. However, I sort of felt confused by the different clans and abilities and by the Warpers. I could not understand why Yelena was so scared of her magic when it could save everyone. Like, the world building didn’t quite make me feel like magic was dangerous and bad and not to be trusted. I mean, okay, I did read the first two books years ago and maybe that feeling of ominousness is supposed to carry over from those books, but I wasn’t feeling it. Well, I did love all the animal telepathy communication. So plus one for that y’all. As for the romance, Fire Study is not quite a kissing book. Yeah, Valek has a lot of appearances. HOWEVER, he’s missing in action for most of the book. When the two do reunite for a few scenes, I kind of felt like it was not enough. I kind of felt like it was too much of a tease. Y’all, I am very very much team Yelena and Valek and team LET THEM FINALLY BE TOGETHER AND HAPPY. Alas, this book was a bit much for me with it’s lack of page time dedicated to the two. Honestly, this book dragged. It didn’t engage me quite like the previous two books. Yet, it could have been so much worse. I mean, I finished the book and am glad for the outcome. I’ve started Shadow Study, the next book in the series and I like it so far, much better than this one. I don’t know though. It’s kind of like this book has lost the mojo of the previous two books in the series. It’s not terrible, but definitely not the best these Ixia and Sitia-set books have to offer. Oh man, I soo need to read Poison Study. It’s been on my TBR for years. But I am a bit intimidated. Glad you enjoyed this, even though it wasn’t love. Sorry you weren’t crazy about this one! I remember really enjoying it. I haven’t read the newest Study book yet, but I also love finishing a series. I feel like this past year I’ve been stuck with a lot of series at just one book left! I’ve only ever read the first two books in the Healer series by Snyder, but I felt a bit similar when I was reading the second book. After the main couple is finally a couple, it seems as if she can no longer sustain the tension/romance. In the end I never even read the final book in the Healer trilogy because I lost interest. I’m sad to hear you felt this way, April! I binge read all three books in the series, and enjoyed them immensely. My favorite might’ve been Poison Study, but I didn’t feel like the third book was a “feather on my cap”. However, I know of a lot of people that DID feel this way… Wish you could’ve enjoyed it as much as I did, and that you WILL enjoy Shadow Study as much as I did!